Yoga is a great form of exercise with different types. It not only improves the body but the mind as well as it helps take away the stress. Research has shown that more than 20 million people practice this and the number goes up every year. Yoga enthusiasts can count on the Yoga Energy blog to give them the information they need on this relaxing form of exercise. The blog on yoga, happiness and spirituality provides details on the types of yoga, mantras, recipes for a healthy diet and some inspirational videos. It also shares valuable and interesting stories about life experiences and people who provide inspiration. 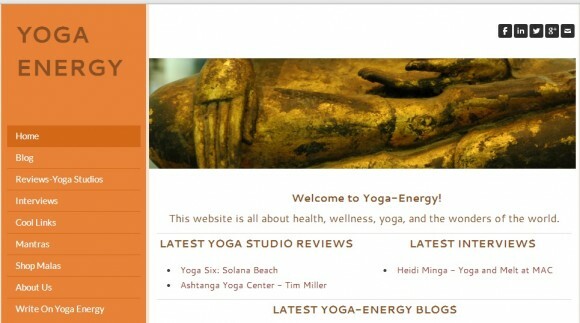 The main Yoga Energy site offers reviews of yoga studios, interviews with the experts and a list of yoga-energy blogs. Sandra Cadet de Fontenay, a certified yoga instructor, is the woman behind the Yoga Energy site. An avid practitioner since 2009, she completed her yoga certification in Thailand. Since then, she has been passionate about all things Yoga. Nicolas de Fontenay is her partner in managing the website.